Let's not beat around the bush: anime has had a pretty rough time in Hollywood. Speed Racer , the first modern anime adaptation, was poised to create a new anime boom in the American film industry before it sputtered out in a brightly colored fit of cult-classic glory. Dragonball Evolution came five years too late and sent audiences alternatively booing and laughing from the theaters. Big-name directors and producers like James Cameron, Leonardo DiCaprio, and Will Smith have expressed interest in properties like Battle Angel Alita , Akira , and Oldboy , all of which have disappeared into production purgatory [EDIT: Oldboy has actually made it to post-production, my mistake]. And let's not forget Neon Genesis Evangelion , once on its way to a high-profile live-action debut from The Lord of the Rings ' Weta Workshop, which died a slow death despite repeated reassurances from executives at anime distributor A.D. Vision. Hollywood isn't buying anime, and it might be a long time before they work up the courage to try again. del Toro has managed to create the best anime movie yet, and he did it by not making it an anime movie at all. But as any good geek knows, the fans will always find a way. Usually their method of choice is amateur short films and fake trailers posted on YouTube, but there's one fan who's lucky enough to have a much bigger stage for his geek fantasies — Guillermo del Toro. The Mexican director made a name for himself on the Hellboy films and Pan's Labyrinth , two films with astounding art direction. Fortunatey for us, del Toro is a fanboy, and it was only a matter of time before his love of anime and giant monster movies got the better of him. Backed up by the studio muscle of Warner Bros. and Legendary Pictures, del Toro has managed to create the best anime movie yet, and he did it by not making it an anime movie at all. 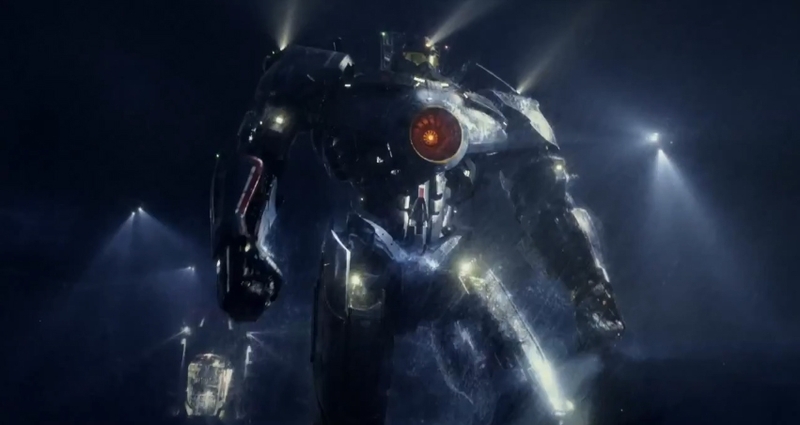 del Toro's latest effort is Pacific Rim , a big, loud action movie about robots punching dinosaurs. The story begins with a monologue and a montage; giant monsters called "Kaiju" (the word for the Japanese giant monster genre) appeared from a dimensional rift in the Pacific Ocean and immediately began to devastate population centers around the world. Humanity responded the way any 8-year-old boy would: with giant robots! The humanoid machines, called Jaegers (German for "hunter"), each require two pilots to synchronize their consciousnesses in order to control them, and the Jaegers' movements are matched to the pilots' movements inside the cockpit. Our hero is Raleigh (Hannam), an American Jaeger pilot fighting under the command of Stacker Pentecost (Idris Elba) and working alongside Jaeger expert and aspiring pilot Mako Mori (Rinko Kikuchi). 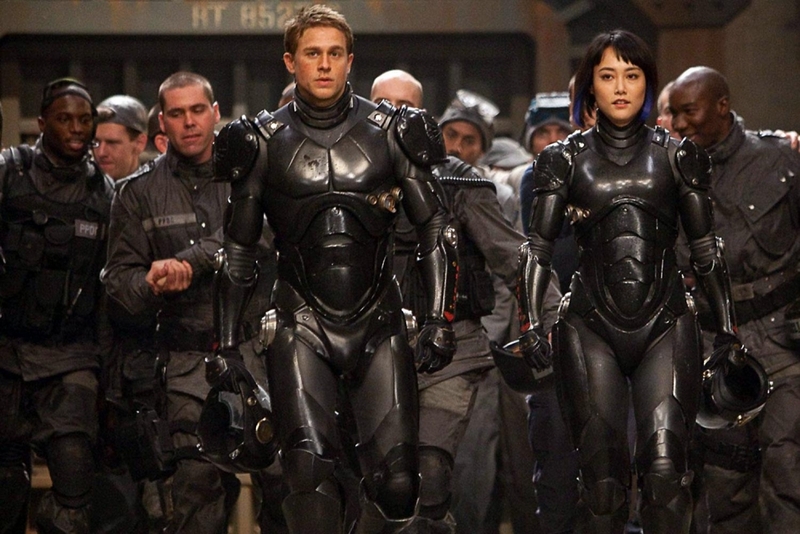 Part of the magic of Pacific Rim is its innocent appropriation of Japanese genre tropes. del Toro is obviously a fan, but his references play out like a little kid accidentally copying his favorite Saturday morning cartoons rather than a seasoned director trying his best to seem original. Somehow this makes it all the more endearing — yellow liquid in the pilots' helmets ( Evangelion ), evil dinosaurs from underground ( Getter Robo ), and a freakin' rocket punch ( Mazinger Z ) have just the right mix of campy reference and del Toro touch. It doesn't hurt that he's got a Japanese star in the form of Kikuchi, known internationally for her spectacular role as a deaf teenager in Babel . In addition to being a welcome Japanese face in a film so obviously influenced by Japanese pop culture, Kikuchi provides a convincing combination of strength and vulnerability as Mako despite her limited English. Hunnam ( Sons of Anarchy ) lays on the swagger as Raleigh, but his attempts to turn his British accent into an American one make for a distractingly wooden performance. Speaking of Brits, though, Elba ( Luther ) is excellent as the gruff commander of the Jaeger team, combining a balance of strength and melancholy just as well as if not better than Kikuchi does. The cast rounds out with It's Always Sunny in Philadelphia 's Charlie Day and Torchwood 's Burn Gorman playing two rival Kaiju scientists who provide exagerrated (though not always funny) comic relief in between the action. Every fight takes place in the pouring rain, and most of them occur at sea, shrouding del Toro's creations and making it hard to decipher battle scenes. Speaking of action, del Toro certainly doesn't disappoint in the "robots hitting things" department, but his most subtle triumph is his restraint. Every time we see a huge honkin' robot punching a huge honkin' monster, things happen. Things are at stake. The level of destruction and even the visual style is reminiscent of Transformers, but Pacific Rim never gives us a city-destroying battle just to put some flashing lights on the screen in between dialogue scenes. Now, let's not forget the monsters. del Toro has a penchant for the grotesque, and his Kaiju are both cool and downright nightmarish. The Jaegers are a little less memorable, but their lumbering, mechanical movement is a convincing (and pretty badass) translation of the giant robot archetype. It's frustrating, then, that every fight takes place in the pouring rain, and most of them occur at sea, shrouding del Toro's creations and making it hard to decipher the director's close shots and quick editing. Pacific Rim 's marketing plays on the spectacle of robots vs. monsters, and while I won't deny that there's a large element of "wow that's awesome a robot just ripped a monster's arm off," what keeps the movie watchable is its humanity — as simple and stupid as it sometimes is. Raleigh and Mako both cope with grief over loved ones throughout the film, and the post-Kaiju world that the characters inhabit feels like a plausible reality in the hands of a director as thoughtful as del Toro. This is a movie populated by cartoon characters, including a British scientist who unironically says "by jove," an Australian man who has a pitbull with him at all times, and a hilariously belligerent black-market entrepreneur (Ron Perlman). Despite all that, and maybe a little bit because of it, Pacific Rim has this odd charm to it, the sort of campy yet sincere bravado that made me fall in love with Joe Johnston's Captain America film. As strange as it sounds, I admire Pacific Rim even though I don't really love it. 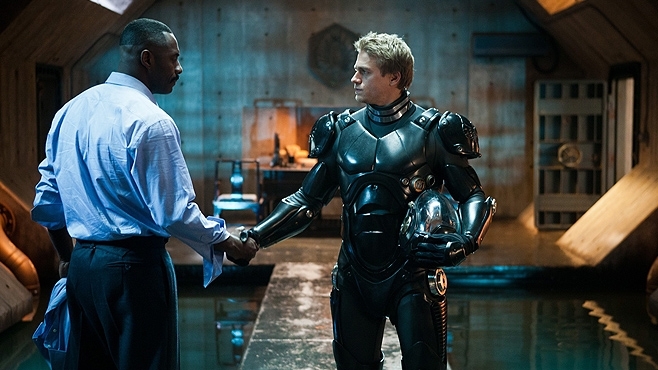 Still, I can't bring myself to heap praise on Pacific Rim because it rarely does anything great. Its flawed spectacle lacks the visceral impact of other summer blockbusters, but its script is too silly and its acting too uneven to rise above its action movie trappings. 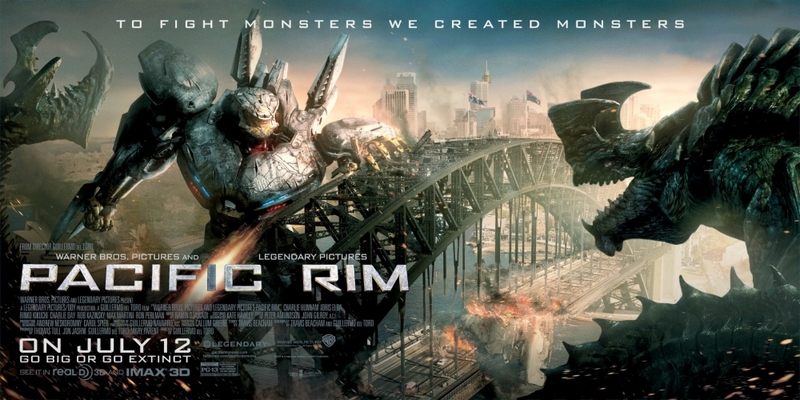 Don't misunderstand, though: Pacific Rim is never boring, and it never really does anything particularly bad. As strange as it sounds, I admire Pacific Rim even though I don't really love it. This is a focused, original concept executed by a passionate and creative director, and it's pretty fun to boot. If this is what we get when we let Guillermo smash his two favorite toys together, then I don't want Pacific Rim to be the last of its kind. Viva del Toro. This review is based on a complimentary early screening provided by Warner Bros.
Pacific Rim Giveaway! Mecha vs. Kaiju!